I confess I’m a believer. I’ve had a gratitude practice for a few years now. As we prepare to go around the tables this week here in the U.S. and think about what we’re grateful for, I want to share another version of this practice I’ve been working on: finding a way to be thankful for everything going on in my life. The good, the bad, and the ugly. What’s rough about these concepts is that they fall into that “simple but not easy” category. They’re not difficult to understand intellectually. And yet, so much of what causes us frustration in life stems from our refusal to actually acknowledge “what is.” Ever find yourself thinking things that start with these phrases? That last one is exacerbated even further when we make it personal: I or they / should or shouldn’t be / like this or like that. It’s human nature to resist things we deem unpleasant or that aren’t going the way we want. And while I’m certainly not advocating that we simmer in them mindlessly, I’ve learned the hard way that the more we turn a blind eye or refuse to acknowledge what’s going on, the harder we make it for ourselves. To be sure, looking for the gift can be hard when we’re in the midst of the difficult thing. The “blessing” often doesn’t show its face until much, much later. Yet I do know that when you ask someone you admire about how they got to where they are today – or better yet, who they are today – what you usually hear are stories about weathering difficulty or pain. Overcoming failure. Dealing with loss. It usually isn’t about rainbows and unicorns. And to go one step further: our gratitude for the beautiful things in life simply wouldn’t be as deep or even exist at all without being able to contrast them with our difficult emotions and experiences. Here are a few steps to get you started. You might also apply these with the benefit of hindsight, and consider a situation you’ve already moved past. Think of something about your current reality that you wish were somehow different, not happening, or behind you. Acknowledge that this thing is part of your reality, for now. I remember when I heard the phrase “be with” for the first time, as in: can you be with what’s here? For some reason, “being with” something unpleasant is easier for me than “accepting” it. It’s more active, more empowered. The “for now” piece helps too. Ask yourself: what might this situation be telling me or offering me? Perhaps there is a new skill you’re getting the chance to use for the first time – something you’ve admired in others – or the chance to re-examine an old story about yourself. Personally, I’ve found that when I’m really frustrated by something, it’s often telling me what I really want. (We adult humans often don’t allow ourselves to acknowledge that either.) You may not like what initially comes up here: “oh great, I get the “chance” to practice losing something I wanted!” Stay with it for a bit and keep investigating. What else might be there? If Step 3 comes up empty for now, don’t worry. Even just taking Steps 1 and 2 will go a long way in acknowledging what is and in easing resistance, which is more than half the battle. 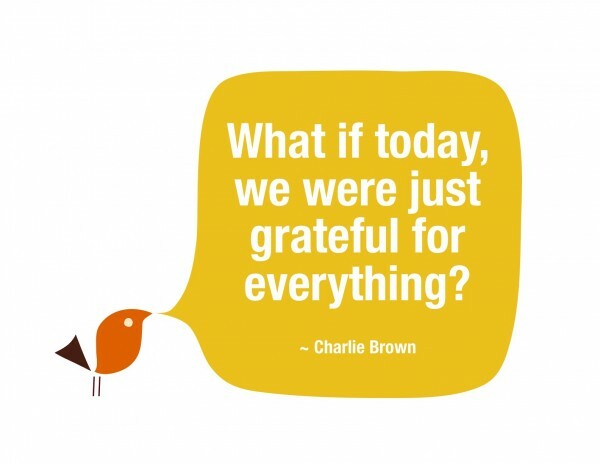 There’s no question this practice isn’t as uplifting as being grateful for the good things in life! My hope is that these thoughts will round out your own Thanksgiving reflections. And to end where I started, if you’re reading this, know that you’ll be among the “things I’m grateful for” when it’s my turn around the table on Thursday! My long-time readers may recognize this post as one I originally wrote at Thanksgiving a few years ago. It received good feedback, thus I wanted to re-post it. And, it keeps me honest about keeping this practice alive!